The hut unique in design: A two story Robinson Crusoe eco style hut/tree house made from timbers, bamboo and palm all under one giant thatched roof. The entertainment area fronts Playa Marsella with plenty of hammocks and rocking chairs. Relax in a hammock with a book and a cocktail or just watch the waves rolling in. Playa Marsella is a tranquil beach and from the upstairs balcony the panoramic sunsets are different colours each day. 6 beach restaurants: all within a short walk from the front gate, have all day menus featuring seafood. If you don't feel like cooking or moving from the hammocks, we can order in! Playa Marsella activities: hire paddle boards, kayaks,Trail Rides on horseback. Playa Maderas is one beach north to try your hand at surfing. Short walk to Frisbee Golf and the Beach Shuttle to/from San Juan Del Sur. Our house suits relaxed travelers, backpackers, couples, families or groups of friends who want to chill right on the beach and enjoy the surroundings of Playa Marsella. Aussie Hut is located on the kilometre-long beach, right in the centre. 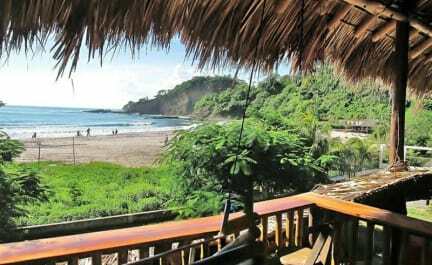 The beach (Playa Marsella) is about 9 km north of the destination town of San Juan del Sur, Nicaragua, and in walking distance of the famous surf beach Playa Maderas. •Ie. Eggs, tomatoes, onions, bread, some fruits, rice, chicken, pasta etc. •Small Nica Grocery Shop 2kms away with everything that suits a Nica recipe. Also has shampoo, washing powder, beverages etc. All Rooms are spacious (upstairs and downstairs) with king sized beds and doubles, all with a view of the ocean. The rooms also have storage drawers, fans, mosquito nets. the upstairs rooms open onto a share balcony with a sofa, couch and hammock all with a panoramic view of Playa Marsella. The downstairs rooms open up onto the garden/hammock area also with an ocean view. Downstairs is all open living with a huge dining table, rocking chairs, sofa, hammocks galore and a bar with swinging chairs. The Self Catering Kitchen is fully equipped with pots, pans, plates, utensils etc along with 2 fridges. The grey water from the sink goes into the compost for growth of plants that are transplanted around the property.